Kosuke Anamizu aka Shewasasea is a Japanese producer who has become famous in Japan through his aliases Mashimoss and Preghost. 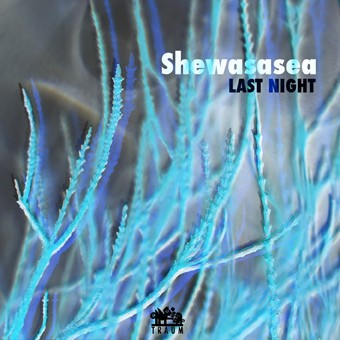 His project Shewasasea is his newest one. Here he combines his experience of sound finding and sound compositions from his other projects with beat programming. Kosuke keeps a low profile and there is not much to be found about his person other than the fine music he writes. We have released with him twice on the Tour De Traum and you will find these tracks here as well. His first solo EP on Traum “Last Night” kicks off with the titled track. A track perfect for summer, lush and progressing as if in a slow-motion-dream like state. “Last Night” has that particular velvet touch and gentleness you might get from future house music but has its experimental roots lurking through. So expect the unexpected to surface. “The New Morning Has Come” is based on an addictive groove programming and cool synth riffs and sequences that remind us of early futuristic music from Detroit. Great composition here with lots of detail that generates a colorful and soulful piece of music. “You (Youuuu)” stirred up people when it came out on Tour de Traum XII and has since then lost nothing of its magic. This is a track full of joy, happiness and spine tingling sound and which adds up to a masterfully crafted composition. It consist of numerous small pieces of sound that result in a magical airy flow you don’t want to miss. There is some funky slapping happening in “Tundra” if we believe Kosuke Anamizu and for sure this track blends a lot of different musical influences to create some emotional & unorthodox music with a bit of a live jam attitude. “Arctic Monk” was released on the last Tour De Traum and appears here as part of the EP as it was originally intended and fits perfectly to the other tracks. The last track “E-E” is a bonus track featuring some nervous 808 drumming and jolly-haunting melodies not unlike what Dominik Eulberg was up to… certainly with a Japanese cultural influence that slices tones into small pieces.